The Bold Bagel: An Art History Analysis of Pierre-Jacques Volaire's "The Eruption of Mt. 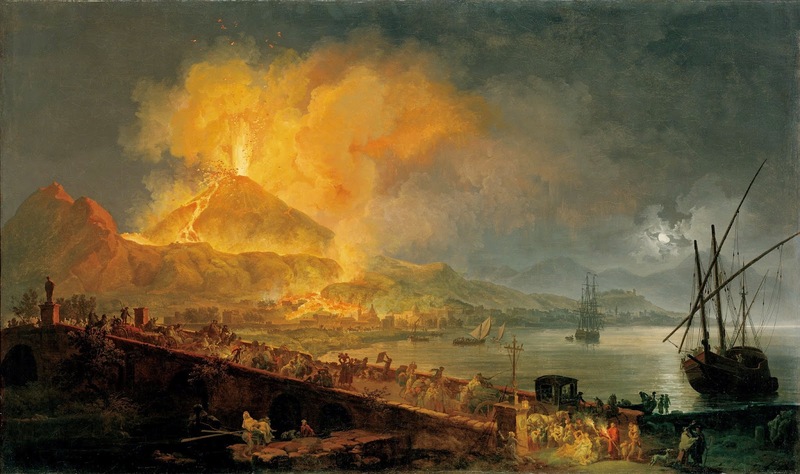 Vesuvius"
An Art History Analysis of Pierre-Jacques Volaire's "The Eruption of Mt. Vesuvius"
Pierre-Jacques Volaire rocked the world with his exposition “The Eruption of Mt. Vesuvius.” Noble Englishmen partaking in the Grand Tour would flock to Naples, Italy to purchase his work and acquire a taste of the history and culture surrounding the destructful volcano. With this, Volaire made a name for himself. 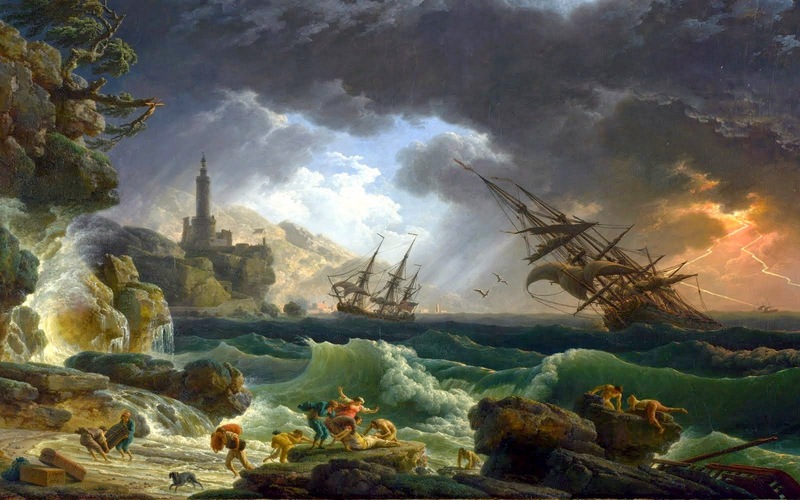 Though many called his artwork repetitive and akin to that of his mentor’s, Claude-Joseph Vernet, Volaire found a niche by implementing Romanticism and Baroque styles into grand landscape paintings. 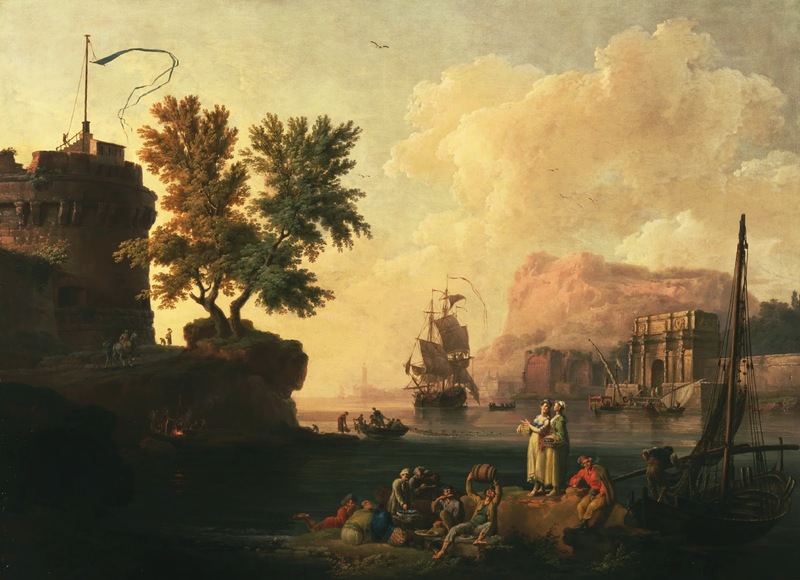 He used setting and current events to propel his art into the global spotlight; the painting at hand was painted in 1777, but he witnessed the eruption of Mount Vesuvius firsthand in 1771. Much of Italian culture and society has been shaped by the sequence of events of its respective time. Take the Roman Empire, for instance. Culture was determined by the vastness of the empire and the assimilation of other societies into the dominant order. Then again in fascist Mussolini-Italy, just over half a century ago. Pride for the state was at an all time high, but the needs of the nation created animosity between the state and the people. Italian culture is defined by its achievements and failures, as are most modern day societies. Of course, the various eruptions by Mount Vesuvius are no exception. As mentioned by the Nature article of J. Logan Lobley, the geological findings and historical observations surrounding Vesuvius do not always match up. The depictions of the volcano’s history and grandeur do not serve it justice - and keep in mind this article was written in 1889, a century after the publication of Volaire’s artistic expertise. This proves just how much cloudiness surrounds the matter of all work on Vesuvius. Though societies during times of eruption were shaken by the utter destruction of nature, many scientists cannot sum up the actual magnitude of this volcano’s history as Volaire has. researchers failed to place Vesuvius in it’s own category of social changes, Volaire found a way to make his painting exemplify the turmoil of his time. Slyly implementing the Baroque style, which was slowly dying around this time, Volaire gives glamour to the idea in fear of nature. Through the Enlightenment, many of these styles transitioned to Romanticism, which focused on inspiration and beautification of reality. Baroque was very religion centred as the movement originated from the Catholic church’s attempt to maintain faith despite Protestant reforms; thus, “fear of nature” could easily be translated to “fear of God.” The implementation of Romanticism juxtaposes this, however, as the chaos unfolding in the foreground, with people rushing to escape from the vicinity, and the destruction of the eruption in the background paint a stark reality when compared to the tranquility seen in the water just a few brushes away. The article by Mariamilani emphasises the relationship between Baroque and Romanticism, especially in eighteenth-century Rome, as intellectuality and primacy of the individual defeated celestial doctrines. People of this time still held reservations on the Christian God’s wrath, certainly. But the fear of nature for what it is, for nature in its whole, pure self, painted with vibrato on one side and dullness on the other proves just how much the events of the 1771 eruption took an effect on society. as he came from a talented family of painters in Toulon, France. Once he became a master of landscapes utilising Romantic ideals, especially after the appraisal for his work on Vesuvius, Volaire was known worldwide for his accomplishments. Affluent individuals traveling to Naples in order to get a taste for the historical and ancient culture would find themselves marbling at Volaire’s work. With the “The Eruption of Mt. Vesuvius,” Volaire brought the old tale of Pompeii back to life through the events of his present time. The implementation of Enlightenment ideology only intensified this and allowed for a more modern take on Vesuvius. level of detail in this painting is to marvel upon. The actions taking place - the chaos and the tranquility - truly bring out the central life theme of evil living within the most peaceful of places. Through the interplay of dramatic Baroque styles, spiritual Romanticism, and historical context, Pierre-Jacque Volaire managed to draft a painting worth admiration. He places Vesuvius’ ancient history into his modern day context, thus excelling in bringing out the beauty in what is at times deemed unknown. Just like the old tale of Pompeii, “The Eruption of Mt. Vesuvius” is a work set to survive through many, many more ages. ArtNC. "Work of Art: the Eruption of Mt. Vesuvius." ArtNC. N.p., n.d. Web. Bagley, Mary. "Mount Vesuvius & Pompeii: Facts & History." LiveScience. N.p., 13 Mar. 2013. Web. <http://www.livescience.com/>. Lobley, J. L. "Mount Vesuvius." Nature 41.1053 (1889): 195. Web. Mariamilani. "Baroque Rome." Mariamilani. N.p., n.d. Web. <http://www.mariamilani.com/>. Paintings. N.p., n.d. Web. <http://www.europeanpaintings.com/>. The Getty. "Pierre-Jacques Volaire." The Getty. N.p., n.d. Web. 30 Mar. The National Gallery. 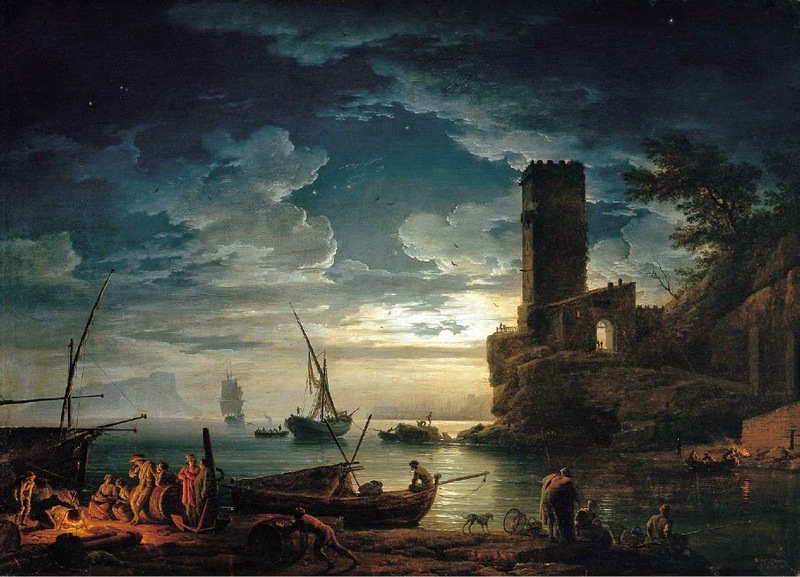 "Claude-Joseph Vernet." The National Gallery. N.p., n.d. Web. 30 Mar. 2015. <http://www.nationalgallery.org.uk/>.